The following list of knife locking mechanisms is given to aid you in your understanding of the various types of blade locks and how they function. ARC Lock. This lock is only found in SOG Specialty Knives and is remarkably similar to the AXIS lock. However, instead of a bar that moves in a vertical motion, the arc lock has a device that moves in an arc. Overall, the bar and arc device both function identically and block the tang of the blade from closing when engaged. 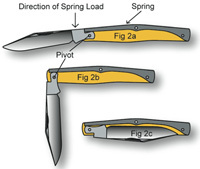 According to SOG Knives... "The Arc-Lock sets the standard in tactical engineering. It has all of the attributes knife designers relentlessly search for, but rarely find. Strength: Arc-Lock surpassed standard holding capacity in independent lab tests. Speed: Action provides fast and smooth one-handed opening. Safety: Positive closing feature ensures that the blade securely stays within the handle when closed. Ambidexterity: Blade can be comfortably accessed with either hand." Chris Reeve Style Integral Lock (RIL). See also "Frame Lock". Developed by custom knifemaker Chris Reeve using the original Walker LinerLock in an integral form. It functions like a traditional LinerLock with the lock's liner comprised from part of the handle scale. Clasp Lock. This style folding knife has no lock or backspring. A clasp locking system uses a piece of strong metal at the top rear of the handle. When the knife is opened, a post inserts itself into that piece of metal similar to a plunge lock. To disengaged the knife, you push up on a clasp so it lifts the piece of metal until the post clears its hole. Sometimes the clasp is a simple metal ring that you pull. Also a style of jack knife that curves upward at the end. Lever Lock. 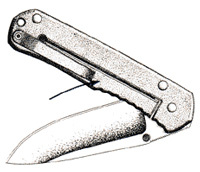 A lever lock knife has a pin that prevents the blade from closing. When the blade is opened completely, the pin from the handle fits snugly into a hole in the tang of blade. Once a lever attached to the knife is pushed down, it lifts the pin out of the tang of the blade, so it can close. The pin also holds the blade closed, so you must press the lever in order to open the knife. 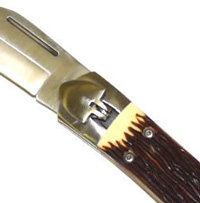 This is a common lock on italian style switchblade knives. Mid Lock. 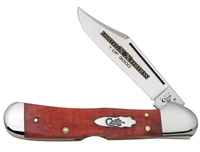 The mid lock is a lockback knife except the release for the lock is located in the middle of the handle rather than at the rear. The spine doesn't extend all the way to the bottom of the handle. The shorter spine can withstand more pressure and as such the lock is stronger than a back lock. Phantom Lock. The Meerkat is the first and only knife from Spyderco to feature the Phantom Lock, which is a hidden lock that operates by sliding the front scale downwards, allowing the blade to unlock and close. One of the criticisms of this lock is that it is easy to accidently disengage under harder use. Roll Lock (Rolling Lock). A roll-lock knife is a type of sliding knife in which the blade rides on a track running the length of the scales, tilting into a detent to lock open or closed. 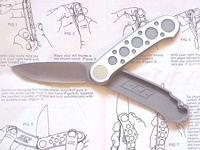 Examples would be the Bench Mark Rollox, or its licensed derivative, the CRKT Rollock. 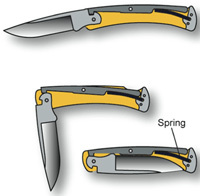 Sliding knives like the Rollox are not considered inertia or gravity knife. Sebenza Lock (FrameLock). The concept of this lock is comparable to the Liner Lock. A hollowed out section of the scale is fixed into the handle cavity to lock the blade open. Spring Lock. A flat piece of steel kept under pressure by the rivet assembly that holds the blade in an open position. They can be one end springs or two end springs. One end springs hold a single blade open, while two end springs hold two blades open; one on each end. Tri-Ad Lock. The Tri-Ad locking system is exclusively licensed to Cold Steel. It resembles the lockback in that the tang of the blade fits into a notch along the spine, but there is a patented "stop pin" that redistributes the pressure from the lock to the spine for additional strength. Twist (Collar) Lock. Sometimes known as a collar lock, the twist lock requires you to twist a collar ring at the top of the knife's handle to open and close it. This type is found mostly on Opinel knives. 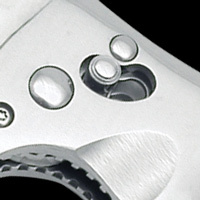 You simply twist the ring until the blade aligns with the vertical slot, so it can open it. To lock it in place, you twist the vertical slot away from the blade.